These promotional video clips, using the audio from the CD were prepared by Stone Records. 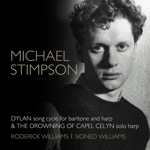 To commemorate the centenary of the birth of Dylan Thomas, Stone Records will be releasing a new album of works by composer Michael Stimpson, including; the acclaimed song cycle ‘Dylan’ together with a new work for solo harp, ‘The Drowning of Capel Celyn’, composed to mark the 50th anniversary of this tragic event in Welsh History. Two of the finest musicians in the UK, Roderick Williams (baritone) and Sioned Williams (harp), join together to give a superb performance of ‘Dylan’, originally recorded at the Llandudno Festival in North Wales. The ‘Dylan’ song cycle was instigated on the stage of the Purcell Room when Sioned Williams, principal harp with the BBC Symphony Orchestra ,was rehearsing a different piece of Michael’s. He said later "I remember making a throwaway remark about doing a piece about Dylan Thomas and it seemed so appropriate, with Sioned’s Welsh background and a series of little coincidences of my own - I had, for example, lived as a student in Delancey Street, opposite a house that Dylan had lived in. And so I began to think through the work and the result was a biographical song cycle based on Dylan’s poems and texts". The cycle traces his life from childhood in Wales, through tempestuous marriage to Caitlin and his long battle with alcoholism, to his untimely death in New York in 1953. The work was premiered at the Brangwyn Hall in Swansea and the Wigmore Hall in London. The recording of this work was taken from the performance of the work at the Llandudno Festival…Michael Stimpson’s composition is a fine understanding of Dylan Thomas, the poet and the man, and this performance made it abundantly clear just how good it is (review, Llandudno Festival). The harp solo,‘The ‘Drowning of Capel Celyn’, began life as another commission for Sioned Williams. She approached Michael for a new piece to mark her 60th birthday. Sioned’s grandfather, Welsh Trade Union leader, politician and poet Huw T. Edwards (1892 – 1970) was chairman of the ‘Save Tryweryn’ campaign that fought hard to overturn the decision to flood the Tryweryn and Capel Celyn valleys to form a reservoir for Liverpool. The CD, Dylan and The Drowning of Capel Celyn, is to be released on Stone Records on January 8th 2016. The publisher, Creighton’s Collection of Cardiff will publish both works to coincide with the CD release. Roderick Williams encompasses a wide repertoire, from baroque to contemporary music, in the opera house, on the concert platform and in recital. He enjoys relationships with all the major UK opera houses and is particularly associated with the baritone roles of Mozart. He has also sung world premieres of operas by, among others, David Sawer, Sally Beamish, Michael van der Aa, Robert Saxton and Alexander Knaifel. Roderick Williams sings concert repertoire with all the BBC orchestras, and many other ensembles including the Royal Scottish National Orchestra, the Philharmonia, London Sinfonietta, Royal Liverpool Philharmonic Orchestra, the Hallé, Britten Sinfonia, Bournemouth Symphony, Scottish Chamber Orchestra and Orchestra of the Age of the Enlightenment. Abroad he has worked with the Berlin Philharmonic, Deutsches Symphonie-Orchester Berlin, Russian National Orchestra, Orchestre Philharmonique de Radio France, Ensemble Orchestral de Paris, Accademia Nazionale di Santa Cecilia in Rome and Bach Collegium Japan amongst others. His many festival appearances include the BBC Proms (including the Last Night in 2014), Edinburgh, Cheltenham, Aldeburgh and Melbourne. He is an accomplished recital artist who can be heard at venues and festivals including Wigmore Hall, Kings Place, LSO St Luke’s, the Perth Concert Hall, Oxford Lieder Festival, London Song Festival and the Musikverein, Vienna. Roderick Williams is also a composer and has had works premiered at the Wigmore and Barbican Halls, the Purcell Room and live on national radio. He will be Artistic Director of Leeds Lieder + in April 2016. As an international soloist and Principal Harpist of the BBCSO since 1990, Sioned has appeared in recital with the Brodsky Quartet, William Bennett, Michael Chance, Michael Cox, Paul Edmund-Davies, Martyn Hill, Garfield Jackson, Steven Isserlis, Neil Mackie, Lisa Milne Nicolet, Mark Padmore and Andrew Watts. Sioned also performs with the BBC Singers, Cantamus, Tenebrae and other choirs. Many of Sioned’s commercial recordings on Chandos, Collins Classics, EMI Classics, Guild Records, Hyperion and Meridian have received international awards; she has partnered James Galway, the Holst Singers, Lisa Milne, Anthony Rolfe-Johnson, Frederica von Stade, the Choir of Kings College Cambridge, The Sixteen, Westminster Cathedral Choir, Winchester Quiristers, Oxford Voices and the Brodsky Quartet on disc. Sioned is renowned for her research on harp music from many eras; she is equally passionate about commissioning and premiering new works for harp solo, concerto and chamber music, resulting in creative presentations with words, poetry and film. Highly acclaimed as an educator, she regularly gives masterclasses and illustrated lectures, appears on selection and examination boards and edits and contributes critical editions, articles and reviews. Sioned is President of the UK Harp Association, and Emeritus Fellow of Harp Studies, Trinity Laban Conservatoire of Music and Dance.